Front & rear fiber optic Williams sights. 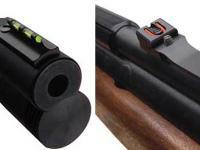 The rear sight is adjustable for windage & elevation. 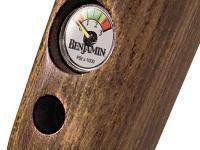 The built-in manometer (air pressure gauge) shows you how much air is in the reservoir. No more guessing! 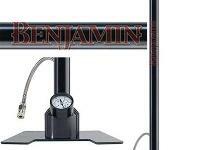 The Benjamin hand pump is easy to use. It's a 3-stage pump that doesn't heat up and clearly shows you when you've reach maximum operating pressure for the Discovery. 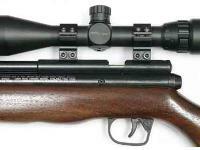 Gun with optional Leapers scope & rings. 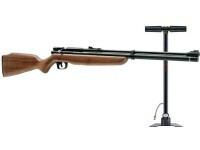 Please Note: The gun is warrantied for 5 years, but the hand pump has a 90-day warranty. 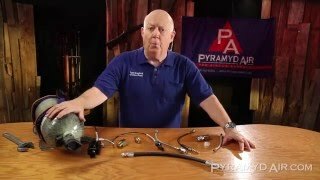 If you prefer to use a scuba tank instead of the hand pump, you'll need a scuba tank adapter with hose and a female quick-disconnect with male threads. The last item already comes with this kit. The adapter fits tanks with a K valve. The air reservoir has a male Foster fitting. 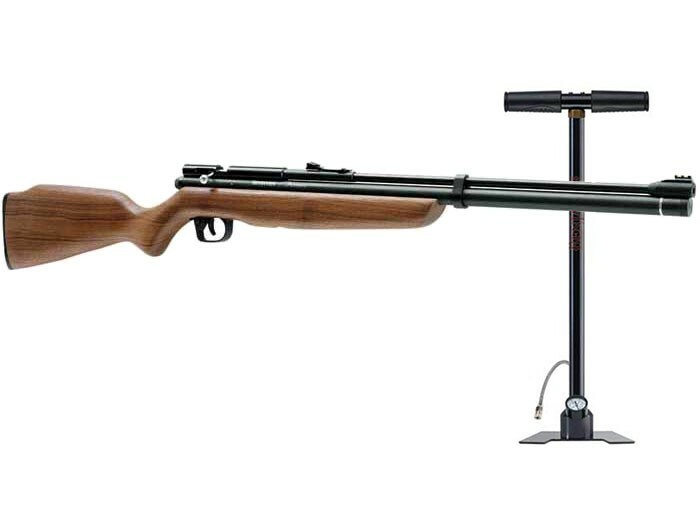 The gun comes with a hardwood stock (14" length of pull), Williams fiber optic front and rear sights, and a built-in air pressure gauge. Included in the package is a hand pump that's easy to use and very clear on showing you when you've reached maximum operating pressure. If you want to switch to CO2, that's easy to do. A degasser tool lets you quickly and safely exhaust all the high-pressure air (or you can just shoot the air out). Attach the optional CO2 adapter, connect it to a standard paintball CO2 tank and fill 'er up! Now, commence to shootin'! With high-pressure air, you'll get up to 25 powerful shots before you need to pump up again. On CO2, you'll get a lot more shots per fill. Things I liked: This is in regard to the .22 caliber model. Great value, consistent accuracy, very consistent velocity for a non-regulated valve, ease of re-filling air, size-weight and balance is great. It has ample power for small game, target shooting at longer range and inter-active target shooting where some "oomph" is required to make the target do it's thing. The included pump has been easy to use and trouble free for over 2 years of regular use. Things I would have changed: The loading port is small and requires careful loading. It becomes somewhat more difficult with a scope mounted. What others should know: We ran our .22 over a chronograph with Crosman Premier HP pellets (the most accurate of all the pellets we tried). The first 4 shots at 2000 psi are averaging 798 fps. After that the velocity jumps to 812 fps (1850 psi) and hangs in there for about 5 shots. Shot 10 or 11 will always show a slight dip in velocity to the mid 700's, but the accuracy and point of impact on the 25 yard target remains consistent until about shot 16 where the POI starts to drop. We have a Leupold Vari X-III 3.5-10X scope on this rifle. The scope may be over-kill for this set-up but we had it lying around with no other use. Accuracy is phenomenal. 25 yard 10-shot groups are less than a Dime in size. With no wind (or indoors) we've squeezed out 6 shot 1-hole groups. This is also with the scope on 10X. The trigger is a little mushy and takes some getting used to, but at this pricepoint it's hard to complain. We shot 44 red squirrels last season. Shots were from 20 -45 yards, mostly head shots. Those 14.3 grain Premiers will give you excellent velocity to weight for this PCP, don’t go too heavy. Crosman/Benjamin made this PCP to be perfectly matched to the Premiers. Woodys World. Things I liked: The discovery was my first pcp and still is my favorite. 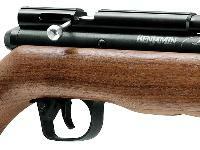 I will start off by saying I really enjoy the more traditional look of a wood stock. The fit and finish is very nice for the price point. I love that the rifle has a smaller resovoir so that it is pump friendly, but also I get a crazy amount of fills off my small carbon fiber bottle!! The discovery is also very light even with a scope mounted. I have found it a pleasure carrying it in the woods. 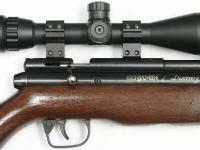 The bolt action is very smooth and placing a pellet is no problem. I have other airguns but is the one I will never part with. It has taken many squirrels rabbits and even raccoons. The gun is very accurate. Mine seems to like many .22 pellets, but my go to have been the H&N Barracuda hunters. Things I would have changed: The things I would have changed I did. They include a tko muzzle brake. This takes the loud report to a whisper. I added a brass aftermarket trigger from baker airguns. I good upgrade for trigger feel. An extra barrel band to really hold the barrel still. I think this made an accurate rifle into a really accurate one. One could hope for a multi-shot, but I find the single shot causes me to slow down and enjoy my rifle more. What others should know: I would suggest a tko muzzle brake as a must. It just makes the rifle so quiet. I would not hesitate on purchasing this one. If something ever happened to mine I would purchase another in a heartbeat. Who knows it might become your favorite too!!! 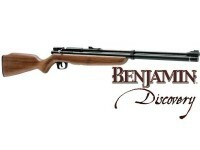 Things I liked: The Benjamin Discovery is a solid, accurate, air rifle at a good price. This pump does a good job filling the rifle and is simple to use. Most people will have no problem pumping the rifle from the lower end of the cylinder capacity to the maximum recommended pressure. That means that one can have a good PCP air rifle without buying an expensive compressor or having access to a compressor. With a suppressor, one can very comfortably shoot the rifle indoors without ear protection. Shooting outdoors without a suppressor or ear protection may be okay, but most will prefer having one or the other. 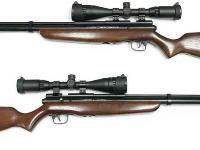 Many other accessories are available for these rifles from various aftermarket dealers. Benjamin may not always approve, but these accessories can be nice options. For someone wanting to get into PCP shooting on a budget, the Discovery remains a great choice. Things I would have changed: One company makes an excellent aftermarket suppressor, but the valve cover doesn't fit with the compressor installed. Benjamin should accept that many people want a suppressor and change the design of the valve cover to accommodate the suppressor. I can imagine a cover with three semi-circular depressions at 120 degrees from one another looking good without the suppressor and both looking good and functioning well with the suppressor. A slightly longer hose on the pump might be nice. Getting the rifle in a good position for pumping can be awkward at times. What others should know: The bolt will be stiff for the first dozen or so shots, but the bolt will be pretty smooth within a short time. I've heard that someone makes a "stripper clip" loading system. This device doesn't turn the rifle completely into a bolt-action repeater, but the device does help position pellets for faster feeding from shot to shot. I haven't taken the time and money to get one of these, but many people will enjoy their rifle more with this addition. 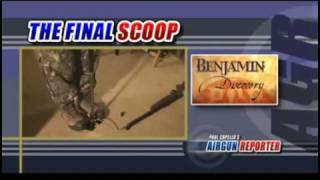 Will Benjamin/Crosman be making the Discovery in a .177 again? Why do i only get 15 shots out of my disco ? It is not leaking air and i fill it to 2000psi with my scuba tank .